Hi! This side Sanjana Kashyap, want to share my own story and the journey of my IVF success story first try from Select IVF fertility clinic. At the initial time, when my husband and I got to know about my infertility disorder, I just felt down in the dumps; unable to express that hard moment when i came in front of my own reality that I am unable to give birth of my own baby. Even today as well, i remember that date, when the doctor had checked me and said that i am impotent, the date was – 11th June 2017. Anyways, my husband supported me like hell, and gave me moral support. He started to search in the net about the treatments or some natural way to conceive, he got to know about IVF treatment or test tube baby course (about test tube baby treatment, i have heard alot but i didn’t know that IVF is the synonym of test tube programme). My husband read about IVF treatment, has discussed with relatives and finally we came to a conclusion that we should undergo this treatment. Now, the second and main point, which came in our mind, was that- from where we should go for IVF treatment., this was that situation where my husband, and me both got confounded where to go and what to do. Seriously, at present time, if i count those days, that was the worst days of our life, but hope you all have heard this phrase – where there is a will, there is a way and our striving rewarded. Select IVF – a fertility clinic which entered in our life as a Boon or a Godsend gift and changed our days from down in luck into happening days. When we have decided to undergo IVF treatment, many of the reviews from net, even from some relatives, i got to know that first try of IVF may not be successful, so i was tensed whether my first try of IVF will be successful or not. Talking about Select IVF, must say that this clinic has changed my evil times of infertility into my golden days of parenthood. On 25th of June, we visited first time in this clinic, the time I entered, i don’t know what came in my mind and i just pre-booked this clinic for my IVF treatment after visualizing the infra of Select IVF, decency and well-coordinated team of this clinic. Moreover, when i met the senior fertility doctor – Dr. Nalini Gupta , i became damn positive, she handled my situation in so perfect manner and made me so comfortable that i was not feeling I am meeting her for the first time. She has asked me several questions about my case, and at last, we have submitted the cheque to the clinic for our treatment. From then my journey of IVF started, several ultrasounds, fertility medications were given in order to get stimulated ovaries and as per recommended by the doctor, i started to take my medicines and injections regularly. The entire procedure of my IVF treatment was beautiful ; i have never suffered and undergone pain or any discomfort during my entire therapeutic. Yes! i agree that i was very nervous as this was my first IVF treatment which i had been going through. The moment when i heard that embryo has successfully attached with the lining of my uterus, i was on seventh heaven. 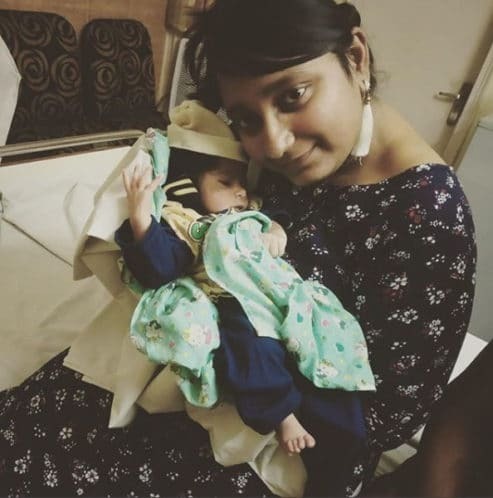 Once i got in pregnancy test, i have done my finger-crossed to hear positive response and finally after waiting so long, i got wind of – ‘ You are Pregnant’. And now here i am, taking joy in my days of motherhood. Hope , haven’t bored you by my article, but it’s just few words to express my gratitude to Select IVF team who has made my IVF successful in the first try.